Woodson Celebrates 25th Anniversary! 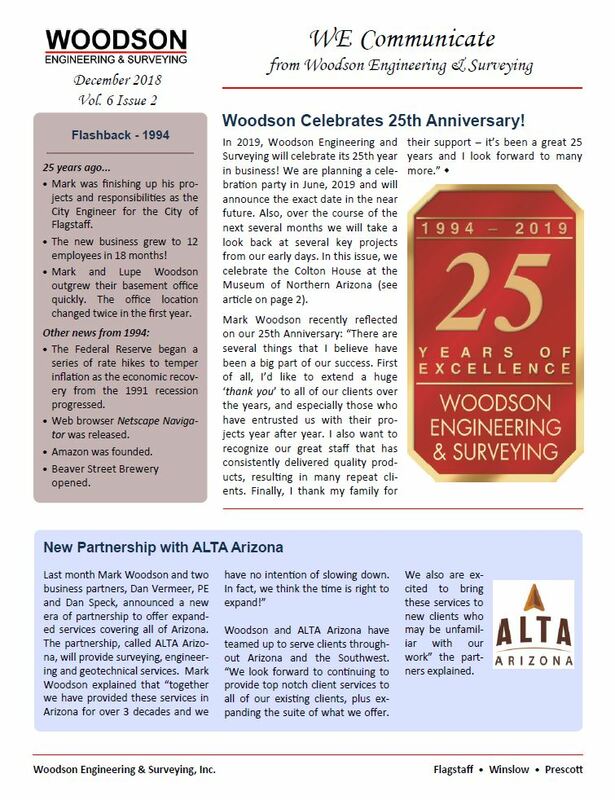 In 2019, Woodson Engineering and Surveying will celebrate its 25th year in business! We are planning a celebration party in June, 2019 and will announce the exact date in the near future. Mark Woodson recently reflected on our 25th Anniversary: “There are several things that I believe have been a big part of our success. First of all, I’d like to extend a huge ‘thank you’ to all of our clients over the years, and especially those who have entrusted us with their projects year after year. I also want to recognize our great staff that has consistently delivered quality products, resulting in many repeat clients. Finally, I thank my family for their support – it’s been a great 25 years and I look forward to many more. Mark Woodson is one of the presenters at the 2018 ASCE/ASHE State Conference on Friday, September 14, in Phoenix. See the program for additional details. Mark Woodson is one of the presenters at the ASCE Phoenix Branch forum on sustainable infrastructure and land use, on Thursday, August 30th. See flyer for additional details. Woodson Engineering and Surveying is pleased to announce two great additions to the Woodson team! John Hall, PE, has joined our team as Senior Project Manager. John has over 30 years of diversified civil engineering consulting experience in the design of civil infrastructure. Also, John Rubel is our new CAD Technician. He brings over 10 years of technical experience in drafting, design, and cartography on a wide variety of projects. See the entire Woodson Team! Construction is underway at Timber Sky! Woodson provided survey and engineering design services for this multi-phased, 200-acre, 1,300-unit master planned community in west Flagstaff, located along Historic Route 66. Our survey team is now providing construction surveying for the project. The Williams City Council recently approved a Resolution adopting the City of Williams Water Mater Plan, prepared by Woodson. The plan detailed wells, reservoirs, treatment, water lines and pumps, and results of the water system modeling. We also provided detailed analysis of the system vulnerabilities, recommended improvements, and costs. We have been selected to provide on-call engineering services at Camp Navajo - a military installation west of Flagstaff under the jurisdiction of the Arizona Department of Emergency and Military Affairs. We have reached substantial completion of a new paving project for the City of Williams. Details will follow in next month's newsletter. The Hills at Slayton Ranch is nearing completion and home sites are available. Woodson has provided surveying, planning and engineering services for the design and platting of all phases of this development in Doney Park, 12 miles northeast of Flagstaff, beginning in 2003. The most recent phase encompasses 105 acres totaling 42 new homesites which are all over 2.2 acres in size with many bordering on the Coconino National Forest. Alicia Stoffers is celebrating 15 years at Woodson! Thank you Alicia! Check out our July Newsletter featuring project highlights, and new staff! Sue Ohl has announced her retirement as Senior Administrative Assistant and Pam Arthur has been hired as Woodson's new Administrative Assistant. We are pleased to announce that Michael Janes, PE, has joined our team as Senior Project Manager. We are pleased to welcome Eva Rowe as our new Engineer In Training (EIT). Jeff Swan will be attending the 90th Annual AZ Water Conference and Exhibition running from May 3-5. Jeff will be presenting a talk on a chlorination mixing system we designed for the City of Flagstaff's reclaimed water tank. April is busy month for Woodson and conferences! The AzTA & ADOT Transit Conference is April 10-11 - look for Grant Evans and Rusty Tweed there. Then April 12-14 is the Roads and Streets conference which will be attended by Mark, Rick, Jeff and Robert! It is an exciting time at Woodson! You can catch up on our recent developments in our December, 2018 Newsletter: Mobile Version or PDF. Newsletters are sent in July and December.